Please send me a copy of your illustration – it is beautiful. I would very much like to work on it further for a tattoo. Well done. Unfortunately, due to licensing restrictions on the file I started out with I cannot just email you the file. You can, however, purchase the artwork which I used as the base for mine from iStockPhoto (http://tinyurl.com/2le6cr) for about $5. with what type of laser it has been engraved i would like to know. Maurits – I have no clue what type of specific laser was used, but you can always contact Joe at Engrave (http://www.engraveyourtech.com/) and ask him. I’m sure he’d let you know what type of machine he is using. I love what you did! It’s so cool and definitely makes your mac unique. I might be visiting a friend in oregon so I was wondering… can you let us know how much it approximately cost to do this? THANKS! 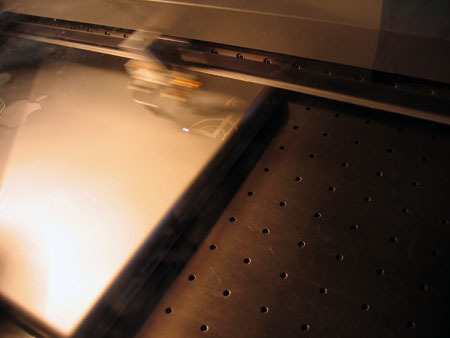 Marie – You can find pricing for the etching services on their website at http://www.engraveyourtech.com. is there any places in australia that will do that?? Nicki — You’ll want to contact Joe at EngraveYourTech.com, as I have no idea what the settings were. Hope this helps! I laser burn wooden canes, but have burned laptops, ipods, and even fingernails! For wood, our 25 watt Universal Laser System (Versalaser) engraver is set to 45% power on 100% speed. For plastic, and ipods, I lower the power to 15% power and 100% speed. It doesnt take much to take the anodized coating off the ipods. Sometimes, the laptops require 2 passes, but not often. Where can I get these stencils at? I’d love to play with them on a few friends laptops and post the results. 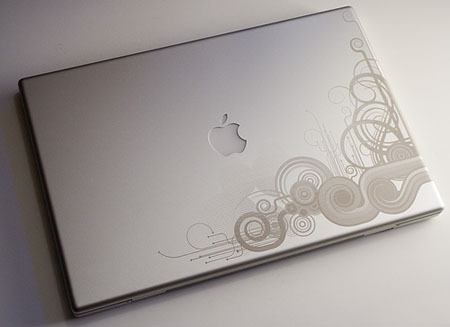 That is nice, great design and it compliments the Macbook. No, it does not techincally void the warranty. In fact, I had to have the lid replaced on my MBP due to an issue with the screen, and the Apple Store here in Portland fixed it without issue. In fact, I even went and got it re-engraved with the exact same design after it was replaced. Your mileage may vary, but it does not technically void the warranty. Thats very cool, did you get it done in the UK? That’s a cool design, I like it…but I hope you never expect Apple to service that portable under its limited warranty or AppleCare Protection Plan. Why did you not use Illustrator? @Jon thom: Apparently the laser etching machine only allows you to connect with CorelDraw. I do wish we could have used Illustrator, however. @Andrew: Actually, I have already had my MacBook Pro serviced by the local Apple store without issue. It is no different then you bringing in a MacBook with a scratched lid/case. The Universal Laser mentioned by Cane Master accepts input from any graphic software, Corel, Illustrator, Photoshop even AutoCad. The Versalaser is a desktop model. Your PowerBook design is very well done. It is much better than the typical dragon and skull engraving chosen by the gamers. I use a GRAVOGRAPH LS100 at work and I was wondering, what settings do you use to engrave plastics, such as an iPod case, a laptop, maybe even a cell phone, things of that nature. We’ve a gravograph LS100 30W too at work and wanted to know what are the settings to engrave plastics ipod’s, laptop and cell phones too. Such as John. That is an awesome design. You are right it is just like getting a tattoo. The designs are not removable once it is done. It can be done with a CO2 Laser. I have one, and the settings are not always the same. 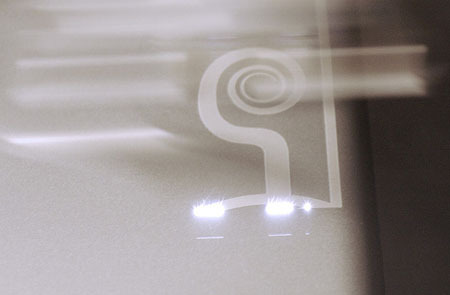 Besides depending on the wattage of the laser, and the laser itself (older laser tubes need more power) the main consideration in the artwork and the effect you want on the materials. I have been able to even etch pictures on MacBook Pros. I should post some pictures some time. If anybody is interested, I am in the Los Angeles Area. Drop me a line at george -at- t7packaging -dot- com. hey, can you give me the phone number of this engrave your tech place? they dont have one on their website and they wont return my emails. @Zachary: Sorry, I don’t have a phone number for them. All I can say is WOW, this is an amazing idea and an equally amazing job! What a brilliant idea. I’m going to forward this to all my mac friends like straight away (and those who really really like their laptops even though they aren’t macs). I guess, with technology, you want to spend the money on something you’re going to be using for a long time; this might be hard with technology. But this is still a great idea. Hope it wasn’t too expensive, as I’m sure a lot of my friends would love to do this!